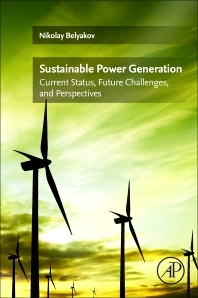 Sustainable Power Generation: Current Status, Future Challenges and Perspectives addresses emerging problems faced by the transition to sustainable electricity generation and combines perspectives of engineering and economics to provide a well-rounded overview. This book features an in-depth discussion of the main aspects of sustainable energy and the infrastructure of existing technologies. It goes on to evaluate natural resources that are sustainable and convenient forms of energy, and finishes with an investigation of the environmental effects of energy systems and power generating systems of the future. Other sections tackle fundamental topics such as thermal power, nuclear energy, bioenergy, hydropower, challenges and risks to sustainable options and emerging technologies that support global power trends. Sustainable Power Generation explores the future of sustainable electricity generation, highlighting topics such as energy justice, emerging competences, and major transitions that need to be navigated. This is an ideal reference for researchers, engineers, and other technical specialists working in the energy sector, as well as environmental specialists and policy makers. 22. Can We Build Sustainable Power Generation System? Dr. Nikolay Belyakov is an acting manager of corporate sales development in a petrochemical holding SIBUR where he leads cross-functional projects in digitalization, sales, marketing, and business process optimization. Since 2017, he has also been a country contributor and peer-reviewer in REN21 Global Status Report on a voluntary basis. Prior to this he was employed as a segment manager for thermal and renewable power within Hilti Corporation, where he was responsible for developing the company’s strategy and driving global business. Previously he worked in GE in various roles including sales, project management, customer business evaluation, engineering and marketing. He obtained his engineering degree from Bauman Moscow State Technical University, Russia, followed by a PhD in engineering from Peter the Great St. Petersburg Polytechnic University, Russia, and an MBA from the University of St. Gallen, Switzerland. His main research interests include business modeling, mechanical engineering and thermal processes, industry automation, competence build-up and sustainable development.